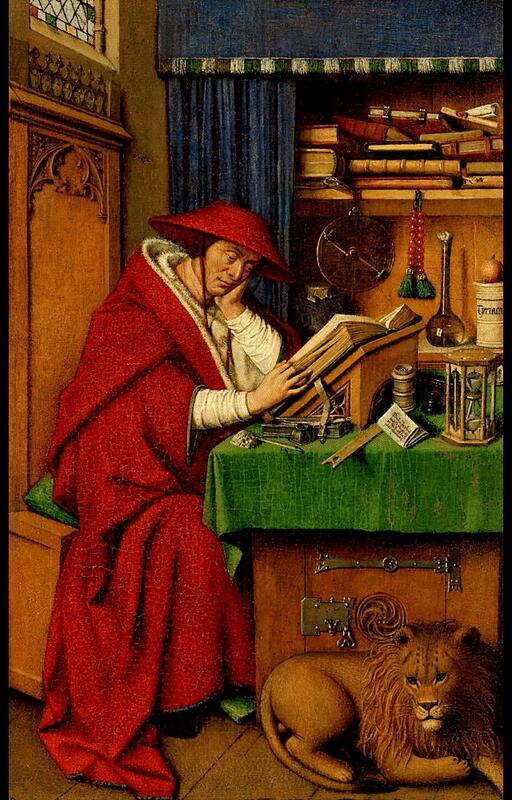 Today is the feast of St. Jerome (AD 347-420), doctor and father of the church (click on his name for a biography) and patron saint of librarians. One of the stories from his life is his encounter with a lion at the monastery in Bethlehem. The other monks ran away in fear, but Jerome realized that the lion was in pain so he calmly removed a thorn from the beast’s foot and the lion became his devoted companion. There’s a bit of irony here since Jerome was known for his irascible temper! 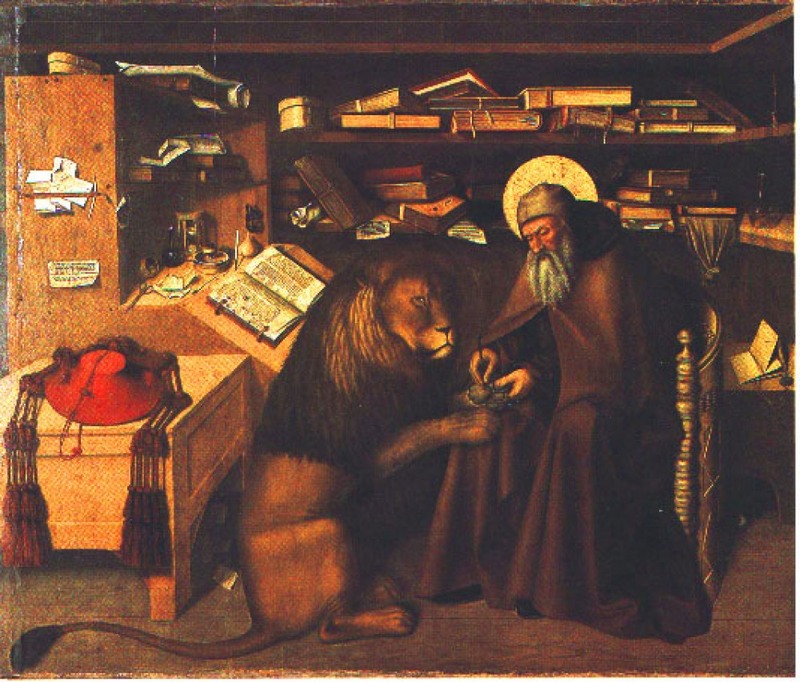 Because of this legend, Jerome is often depicted with a lion, as in the painting above by Neapolitan painter, Niccolò Antonio Colantonio, about whom very little is known. In this charming image, we see Jerome in the act of extracting the thorn. The setting is a scholar’s study, reflecting Jerome’s occupation as a scholarly translator, writer, and theologian. It is thought that Colantonio was influenced by the Flemish master, Jan van Eyck, who visited Naples about this time and whose image of St. Jerome we see below, a painting which may have been started by the great master and finished by his workshop after his death. In Colantonio’s work, Jerome has set aside his Cardinal’s hat for a scholar’s cap and the lion is sized more accurately than the van Eyck painting. But we see the Netherlandish influence in the details of the homely objects in the messy study and the attempted perspective of the tilted desk and table. 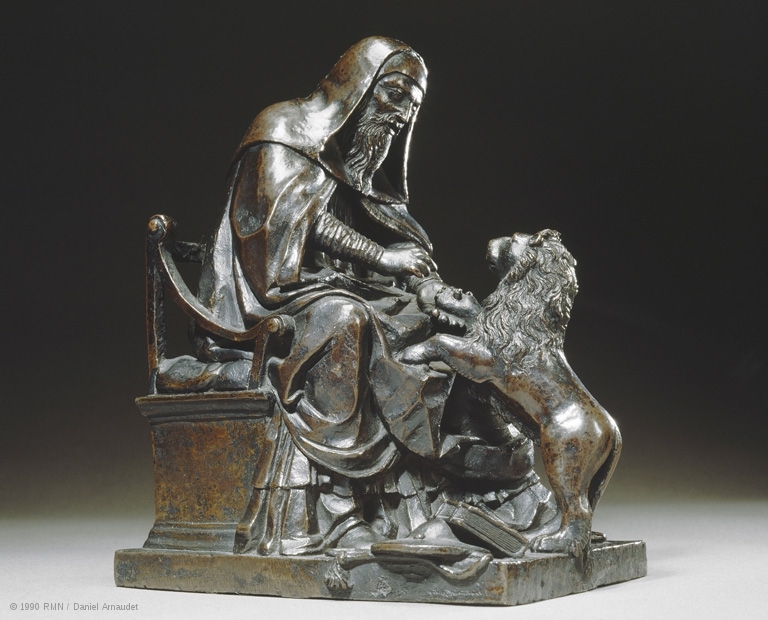 We also see this image of Jerome and the lion in this small bronze sculpture, attributed to Bartolomeo Bellano of Padua in the late 15th century. This compact group is composed around a pyramid structure. At the saint’s feet can be seen a book, recalling his extensive writings on the Bible, and a cardinal’s hat, an allusion to his traditional role as one of the Christian church’s Latin Fathers (his highest official ecclesiastical rank was in fact a spell as secretary to Pope St Damasus I). The lion’s mane shows it to be a mature animal, albeit represented here as the size of a small dog. Man and beast gaze intently at one another. The modeling of Jerome’s simple robes, clearly made from coarse, heavy fabric, reinforces the direct, humane character of the group. The group is attributed to Bartolomeo Bellano, a Paduan sculptor who was a pupil and successor of Donatello (the creator of the celebrated bronze high altar in the church of San Antonio in Padua, known as the Santo). The attribution to Bellano is based on stylistic comparisons with reliefs executed for his monument to Pietro Roccabonella (1491-94, in the church of San Francesco in Padua). The reliefs are still in situ, but the monument was completed by Andrea Riccio in 1498, after Bellano’s death, and has not survived in its original form. Vasari notes that Bellano created a number of small-scale works in marble and bronze for Pope Paul II. The present group may well be one of these. This entry was posted in Art and tagged art history, Bartolomeo Bellano, Catholic, Christian, Jan van Eyck, Jerome, Jerome and the lion, Niccolò Antonio Colantonio.